But the Very Small doesn’t actually drop the “p” word into the tune’s lyrics — it takes a more abstract approach, says drummer Aaron Mann, who wrote the lyrics. “I tried to think of myself as a camera, traveling through these communities, seeing what poverty really entails,” says Mann, 31. But the track is confrontational, too. Lyrics like “Now you all look comfortable” criticize complacency on poverty; “Punish the eye sockets” brings to mind the Ludovico technique. Meanwhile, vocal harmonies and a galloping tempo lend a sense of urgency. While writing the song, Mann says he tried to balance its righteousness with self-awareness. “I wanted to as much as possible avoid [the song] coming from the middle-class white-guy perspective, or it being too prescriptive,” says the musician, who lives in Hyattsville, Maryland. “The Worst Form of Violence” originally appeared on The Very Small’s 2014 LP, Zoomed Way Out. But the eight-year-old group decided to release it again this fall as a single, along with a video (watch it above) directed by Nigel Lyons. The video aims to address poverty with interspersed representations of suffering — “both in an explicit sense but also abstract,” Mann says. The songwriter says it’s all about building awareness. 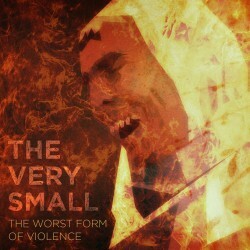 The Very Small plays a video-release show Oct. 4 at DC9.